Franke Pressed stainless steel body tray manufactured from grade 304 (18/10) stainless steel 1,2 mm thick, with a 20 mm square tubing frame all round, two 25 mm diameter support fitted longitudinally to the underside for the Rapid Transfer System and two 20 mm diameter stainless steel handles. Suitable for use with the Rapid Transfer gross anatomy trolley. Franke BTS Standard and BTO obese Body Trays are manufactured from grade 304 stainless steel, complete with 25 mm Ø round stainless steel frames to bottom and handles to suit T4 body racks. Made from Grade 304 stainless steel. 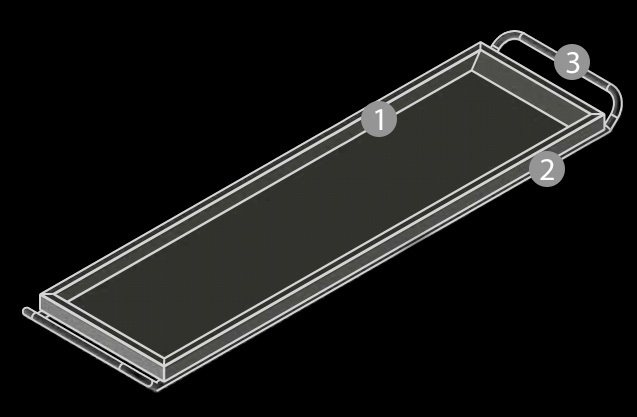 The inside depth of the tray is 50 mm which is according to forensic standards.